How do I scan a document with Epson ScanSmart? 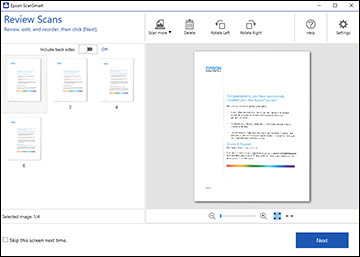 You can scan and review documents in Epson ScanSmart. Note: The images in this guide show Windows screens. Mac screens may be slightly different. Note: Receipt Manager is available for select scanner models. Availability varies by country. Load your original into the scanner. See your scanner's User's Guide for instructions. Note: You can change the scanning button default in the Settings menu. Windows 10: Click > Epson Software > Epson ScanSmart. 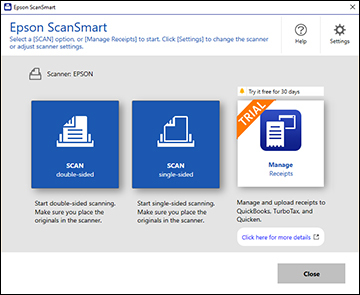 Windows 8.x: Navigate to the Apps screen and select Epson ScanSmart. Windows (other versions): Click or Start, and select All Programs or Programs. Select Epson Software > Epson ScanSmart. 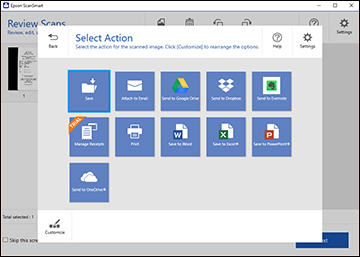 Mac: Open the Applications folder, open the Epson Software folder, and select Epson ScanSmart. Select Scan more to scan more originals. Select Delete to delete selected scanned images. Select a rotate option to rotate each scanned image. If you scanned double-sided, select On or Off for Include back sides if you want to keep or discard the back sides of scanned images. Select an option to save, send, or print the scanned images. See the links below.